This water slide boast bright colors and a large pool! This water slide is perfect for the budget concious and for those that have a smaller area to set up an inflatable water slide. The bright blue and white colors with the attractive dolphins facing each other are sure to catch anyone's eye. This is a front loading water slide so once set up the adults can easily monitor the children from the comfort of a lawn chair or patio area. You can see the children climb up the left side of the water slide and slide down on the right side of this water slide and slide down. This water slide can accomodate children from the ages of 2 years old all the way up to 16 years of age, no adults (sorry). Once the kids climb to the top of the water slide they sit on the platform where the misting hose is located. Once the push off the misting hose ensures that the slide surface is nice and wet for a fun and fast slide down into the large pool at the bottom. The pool at the bottom can be as full as 2.5 feet deep or as shallow at 12 inches, its up to you how much water you would like it to hold. Don't be fooled by the height this is still a very large water slide rental. The best part about Big Lou's Bouncies is we are a full service company! We come out and set up, this includes setting it in a location of your choosing (within reason and saftey) we stake it properly and when your done we come out and tear it all down and take it away. We are fully licensed and insured for any event. Be sure to also check out our Water Combos, which are the best of two worlds. 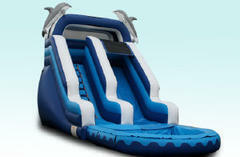 Combos Units include a bounce area, basketball hoop, climb area and also dual lane water slides in most cases. Add or rent a combo instead of a water slide. Also be sure to add a concession machine to the FUN!